Not since the unnerving times of the Arab nationalist revolutions of the 1950s have the monarchies of the Gulf felt so insecure and threatened by the inexorable forces of revolutionary change. Saudi Arabia’s panicky reaction to the tremors of change in Egypt and its frantic counterattack against anti-autocratic agitation in neighboring Bahrain shows a desperate attempt to stem the rising tide of popular demands. Exploiting ideological differences and stoking sectarian divisions, the Saudis are brandishing the specter of Iranian mischief in fermenting populist agitation and rebellion in Sunni domains. Hence the Saudi’s venture to rally Sunni regimes in and outside of the Middle East in a bloc against Iran’s perceived war on the existing Arab order. This is nothing but a plotted shift from popular demands for democracy and a diversion into dangerous doctrinal infights. 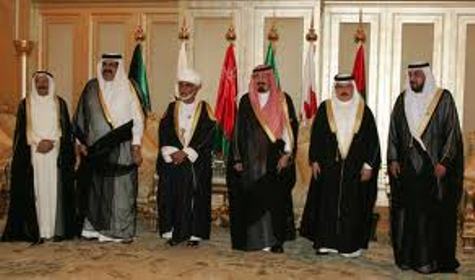 As old certainties fade away, the GCC has emerged as reactionary club par excellence, striving to crush popular revolts within its realm and prevent, or at least manage, the fall of any more regimes in its proximity. Its leader, Saudi Arabia, has mounted an aggressive multi-front strategy to buy peace at home and stability in its regional surroundings. The monarchy uses the power of the purse to appease its own young and restless population as well as prop up the strained finances of the less well-off members of the GCC, namely Oman and Bahrain. Riyadh has also proposed opening its institutional doors to the royalties of Jordan and Morocco who happen to share the same religious identification and threat perception. Both monarchies are reliable allies of the GCC, possess professional security forces, and fear populist demands for credible popular representation and social justice. If this expansion comes to pass, the Middle East would have all its monarchies grouped into one club. The official and public reaction to the GCC’s surprise announcement elicited different responses in both Jordan and Morocco. In Morocco, the invitation was greeted with surprise and popular derision. The timing of the initiative is very suspect. Many Moroccans believe that the GCC’s proposal fits within Saudi Arabia’s ideological agenda to combat democratic stirrings in the Arab world. Street protests have already pushed the monarchy in Morocco to introduce important constitutional reforms and limit some of its prerogatives. Lacking the Saudis’ largess to mollify its people, the regime smartly opted to further liberalize politically. Nevertheless, there is rampant suspicion of Saudi motives of suddenly wanting to upgrade the already close partnership with Morocco. It is common knowledge that the Saudis strongly fear the implications of Morocco’s democratization, and it is not a stretch to believe that they might try to use their financial leverage to pressure the monarchy to slow the reform process it put under way. Moroccans are also concerned that their security forces, hundreds of which have been stationed in parts of the Gulf for decades now, might be called upon to bloodily repress popular uprisings or Shiite revolts in the Gulf. With the exception of radical Salafis, no Moroccan wants to be entangled in the Saudis’ doctrinal war with Iran and Shiism. Such a conflict is a boon for uncompromising doctrinarians and radical ideologues. Similar fears are echoed by many Jordanians who fear being dragged into a sectarian contest that is inimical to the process of democracy-building and the very stability that the Saudis and authoritarian regimes claim to so crave. To be sure, the public reaction in Jordan was not as lukewarm or outright hostile to membership in the GCC. Jordan shares geographic proximity with the Gulf, enjoys certain cultural and tribal affinity with the bloc, and lacks a real sense of national identity. Jordanians also hope to benefit from the movement of labor, discounted oil, and financial aid. Like Moroccans, however, Jordanians are wary of this sudden push to bring Jordan into the GCC fold. There is concern that this is a reactionary move to preserve the current system with very few modifications. A number of Jordanian analysts have voiced worry that the dangerous stoking of regional tensions and ramping up of anti-Shiite rhetoric might be a deliberate strategy to undermine popular pressures for political change. There are serious concerns that King Abdullah II, who has been lobbying hard for membership with the GCC and has enthusiastically jumped in the anti-Shiite bandwagon, might be tempted or pressured to shelve his timid plans for limited political reforms. The king is known for invoking the country’s “bloody borders” and the specter of Iran as a means to forestall political reforms. His recent backtracking from the promises he delivered in his June 14 speech are not reassuring. The king first declared that future prime ministers will be selected in accordance with popular will, then a few days later he retracted, arguing that that transformation will come along only after the emergence of mature political parties in two to three years time. Jordan’s monarch would be better served by following the model of measured reforms just launched by King Mohammed VI of Morocco. The alternative is to “watch it take place in the streets below with uncontrolled consequences,” warned Marwan Muasher, a former senior government official in Jordan. The same applies to the conservative monarchies of the Gulf. They can either opt for reform and become a powerful motor of Arab integration and economic growth, or continue their internal decay until they are swept away by the winds of change. The challenge, however, is how to prevent this royalty club from becoming a reactionary bloc intent on defending the status quo. *Anouar Boukhars is assistant professor of political science and international studies at McDaniel College.